We've worked with retailers to provide a fresh spin on our usual product line, providing unique all natural candles for their unique shops. Interested in custom work for your shop? A candle inspired by the fierceness of the world's one and only museum dedicated to works by women, emboldened by our personal favorite woman artist, Frida Kahlo. We love this exclusive scent of amber, gernaium and lavender and feel it perfectly embodies the mysterious power of Frida. Uncommon Goods loved our Mantra candle line but wanted to mix it up a bit by putting our Yogi candle scents into the meditation jars. Here we have a new collection of mindful candles offered exclusively through their site. DC-based food illustrator Marcella Kriebel wanted a candle collaboration that went well with her illustrated feast art prints. 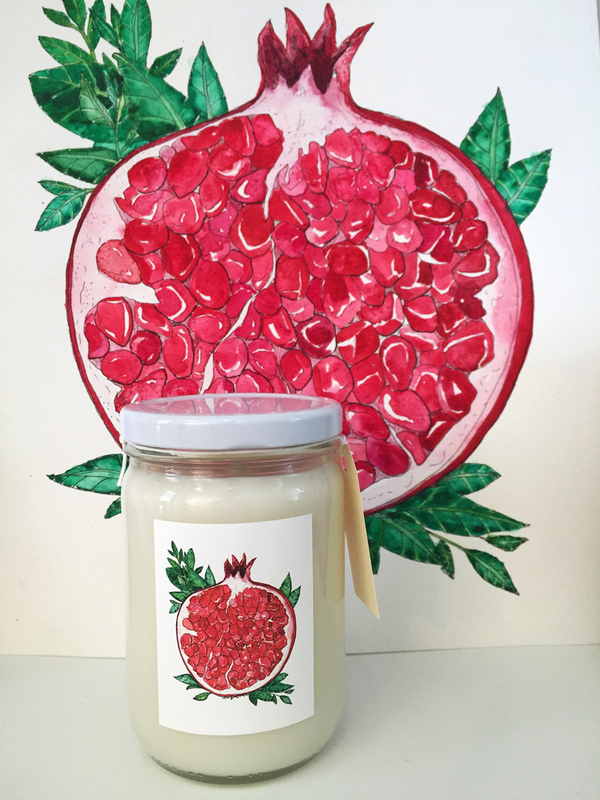 We collaborated on a pomegranate candle labeled with a print of her beautiful pomegranate illustration. DC leather shop Stitch and Rivet wanted a Summery scent that went well with the rustic aesthetic of the shop. We collaborated on this scent, herb garden, contained in our Signature candle jars. Analog, a vintage and handmade shop in Washington, DC wanted something that reflected their yesteryear shop. They sourced an assortment of vintage pyrex and glassware containers for us to fill with warm, Springy scents. Leather shop, Stitch and Rivet, also wanted a uniquely manly scented candle for her leather shop which sells a lot of mens accessories. These leather scented candles are packaged and wrapped in leather labels to make for a very unique find.